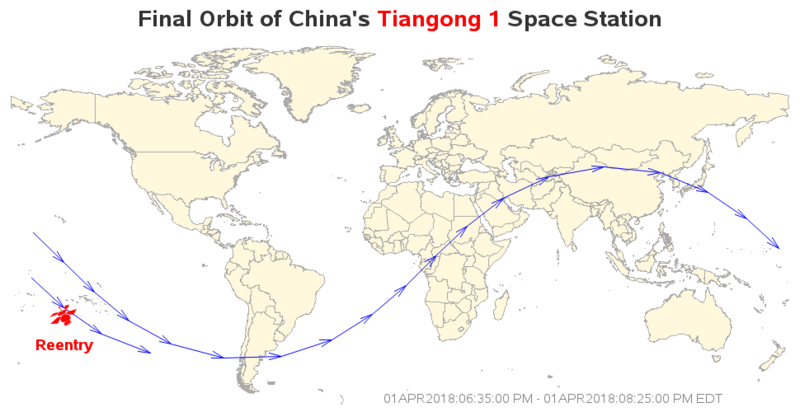 If you grew up as a space-junkie kid like me, then you've probably been watching the news for the past few days, wondering when and where China's Tiangong 1 space station was going to fall out of orbit, and crash to Earth. According to Popular Mechanics (PM), that happened at 8:16pm EDT, April 1, 2018. I would have loved to have the data and knowledge to try to predict the event ... but I guess the next best thing (for a Graph Guy) is to plot the data after-the-fact! But before we get into the data visualization, here's a picture to get you into the mood ... 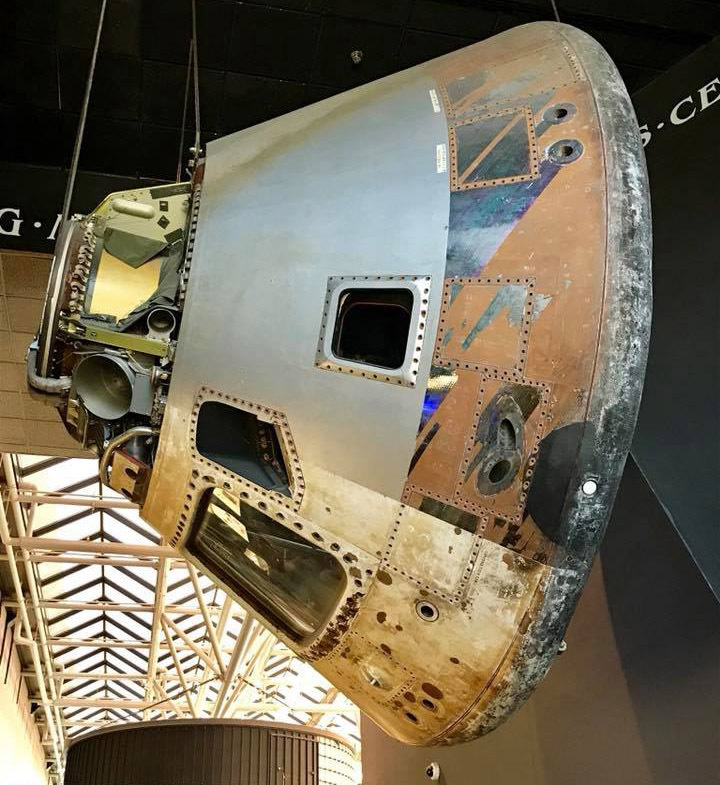 This is a picture of a space capsule, from my buddy Mark. Do you recognize which capsule it is, or where it's located? Which produced the following map. 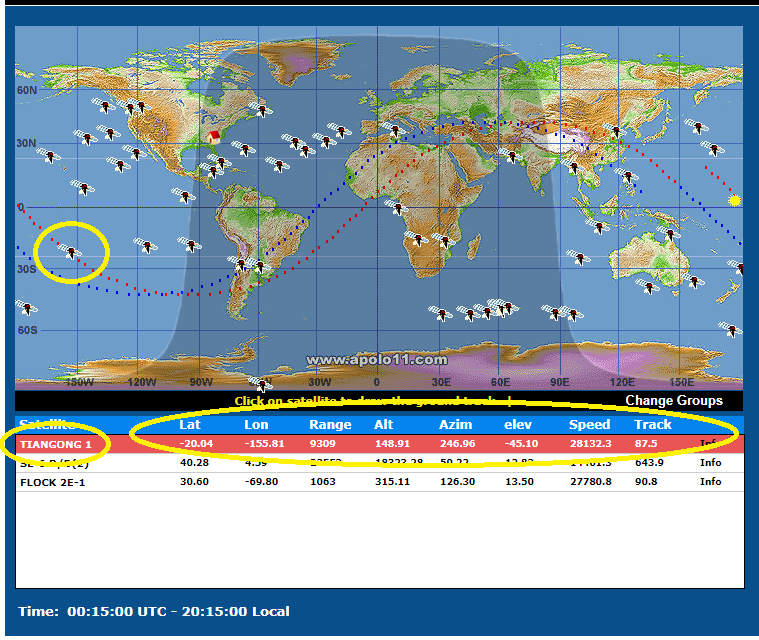 I moused over each satellite until I found the Tiangong 1 (which I've circled in yellow in the screen-capture below). I clicked on that satellite icon, and then the data for Tiangong 1 was displayed at the top of the table below the map (I've also circled that in yellow, to make it easier for you to find). And now the tedious part. I copy-n-pasted the line of data into a text file ... and then repeated this process (select a date/time, find the satellite, click on it, and copy-n-paste the data) for each 5-minute increment, until I had all the data points for the last orbit around the Earth before the satellite reentered. Sometimes getting the data takes more time than plotting it! I used the annotate arrow function to draw the arrows (so you can easily tell what direction it was moving). I used character '6b'x of the Windows Webdings font to plot the image of a satellite (approximately where it reentered). I used the TZONEU2S() function to convert the UTC data/timestamps to EDT (the time zone I live in). When I projected the world map, I saved the projection parameters in a dataset (using the new parmout= option), so that I could later project the satellite path coordinates with the same parameters (using the new parmin= option). This way, I didn't have to combine the map and satellite coordinates, project them together, and separate them. OK you statisticians out there - what is the likelihood of being hit by a piece of (man-made) "space junk" falling from orbit?